Combine 2 sheets nori, water, soy sauce, and salt in a saucepan and simmer. Reduce to half its volume then strain through a fine sieve lined with cheesecloth. Leave to cool. Take each tomato and score an "X" on one end lightly with a pairing knife. Drop the tomatoes in boiling water for 30 seconds to a minute. Transfer the tomatoes in an ice bath. Peel, quarter, and deseed the tomatoes. Marinate the tomatoes in the nori reduction for 4 hours. Whisk together rice vinegar, maple syrup, and salt in a bowl. Rinse glutinous rice in cold water. Combine rice and water in a pot. Bring to a boil. Once boiling, reduce heat to a simmer, cover and cook for 15 minutes. Pour vinegar and sugar mixture over rice and stir. 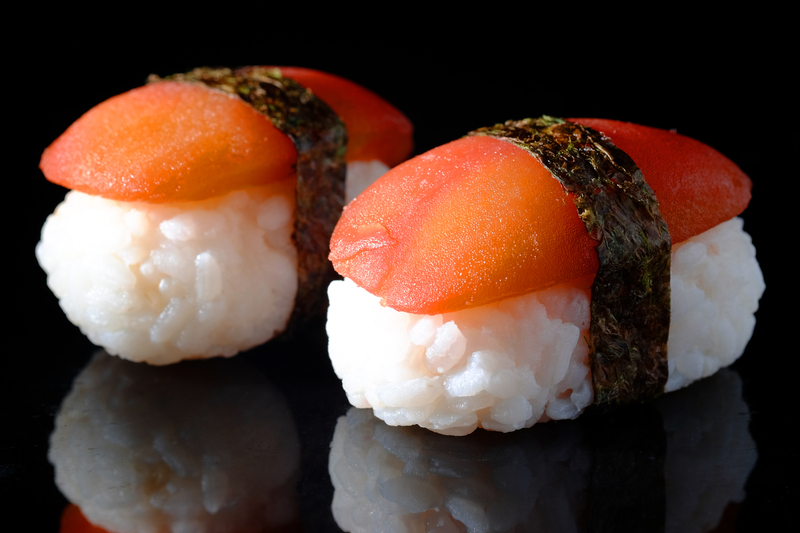 With your hands, form rice into "sushi" portions. 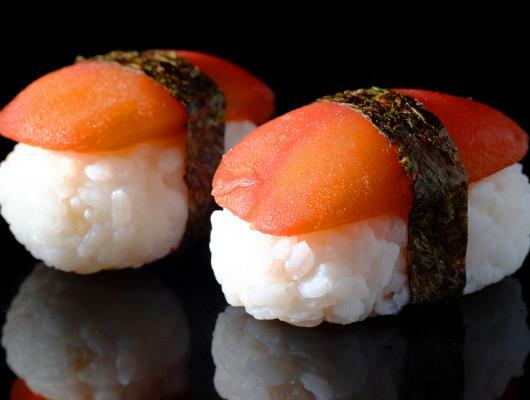 Top each portion of rice with tomato sushi and secure with a strip of nori. Whether you say tomayto or tomahto, whether you consider the tomato a fruit or a vegetable, one thing is for sure, tomato dishes are an essential for men – several studies have supported the link between lycopene in tomatoes and the prevention of prostate cancer. Obviously all of us, young and old will benefit from these fruits which are bursting with essential goodness – Vitamin C, fibre, folic acid, potassium and choline all help support heart health as well as other conditions. Tomatoes are also a great source of the antioxidants beta-carotene and lutein, which along with lycopene are vital for eye health. Combined with Nori(a seaweed), a high nutrient provider, this delicate dish is simply a bundle of health.